I got this in the mail today! It’s a Brathwait minimalist luminous. I’ve been considering it for a while, and finally pulled the trigger. I think it’s pretty suave so far. It’s a tad under 40mm, but it still looks pretty big on my wrist because the case is relatively thick and it’s all dial. I’m really into small watches, so this is about as big as I want to go. I think it toes the line quite well. I’m not sure if I’ll keep it though. I’ve been looking to move into the mechanical world, and I really want one of those old Omega Seamasters, so I might just save up and make the jump there later this year. Brathwait also makes an automatic vsresion of this one, which I’m considering. 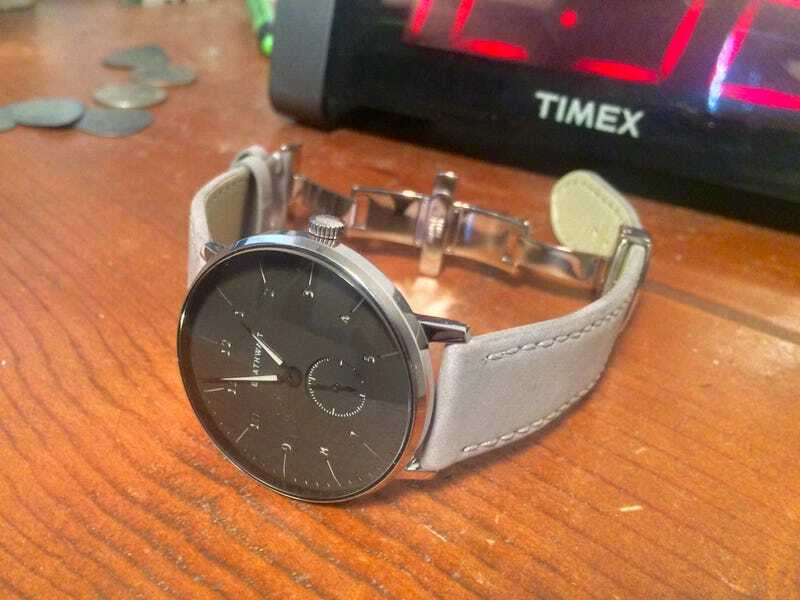 I also ordered a burgundy brown strap for this one, though, so I’ll reserve judgement until then. But I do love the design and quality of this one, and I’d definitely recommend it.